"Mobile commerce" is buzzing around in recent years but is it here already? What is the macro environment in Malaysia? How should we anticipate the growth of m-commerce? "Mobile commerce" is buzzing around in recent years but is it here already? What is the macro environment in Malaysia? 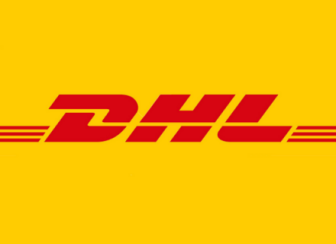 How should we anticipate the growth of m-commerce? We need to first look into the behaviour on how users access the Internet. 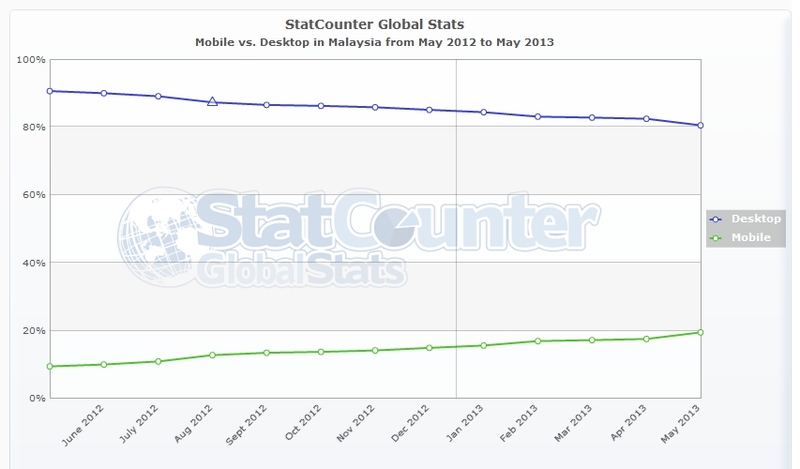 According to StatCounter, mobile usage in Malaysia has increased from 10% in May 2012 to 20% in May 2013, almost double within a year. That means, most likely 20% of your e-commerce site traffic is coming from mobile devices. Is this an indication that up to 20% of your online sales are made via mobile devices too? Why is the growth so significant? Let's look into the current state of mobile devices penetration and the projections by various research data. As for the vast disparity between GfK and Nielsen report, I tend to agree with both Nielsen and this unscientific research in which it is more logical that smartphone penetration rate in Malaysia is around 30%. It could be a tad higher now in 2013 since Malaysia government has provided incentives to increase smartphone use among the youth. Based on current growth rate, it is hard to disagree with McCann's projection that smartphone penetration rate in Malaysia will reach 60% in 2015. What about tablet? Together with smartphone, tablet is also one of the main contributing factors to the 20% mobile traffic. According to Ericsson ConsumerLab, "tablet penetration stands at 9% of the country's population, with potential to grow up to 29% in future" (2012, source). So, how much do Malaysians spend on their mobile devices? 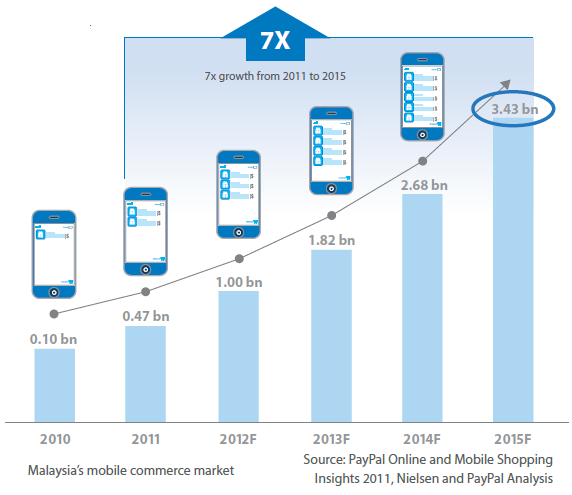 According to Nielsen-PayPal Analysis, m-commerce market size in Malaysia was RM467 million in year 2011. RM337 million (72%) were spent on smartphones while RM108 million (23%) via tablets. The total online commerce market in 2011 by referring to the same report was RM1.97 billion, that means close to 24% was mobile. Nielsen-PayPal is forecasting that total e-commerce market in 2015 will be RM5.67 billion and 60% of it (RM3.43 billion) is mobile. A significant increase from 24%! Mobile is here, but what's next? M-commerce is here and will continue to grow, something that online retailers cannot afford to ignore. 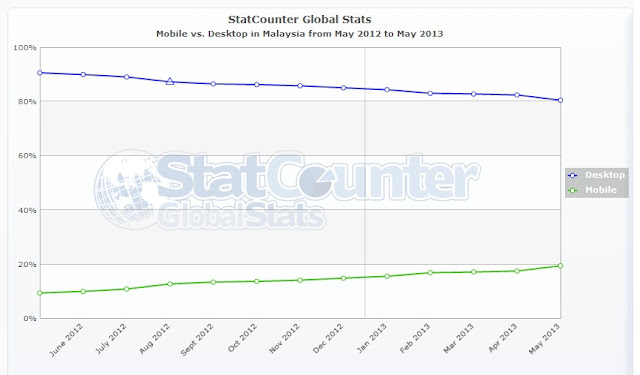 How do Malaysians consume smartphone, tablet? Mobile application, or mobile web (responsive web design)? Is local online marketplace and retailers ready for mobile? How to do more on mobile commerce?